For the first time since its very early years, Facebook is vulnerable. The Cambridge Analytica mess highlighted an important but oft-overlooked fact about Facebook’s business model. Facebook’s business is data, monetized through advertising, not community or social networking. Social networking and community are merely the means by which it gathers and aggregates data and delivers advertising. This was easy enough to forget in the feature wars and fight for online social dominance, but the public now is generally far more aware than ever that if you aren’t paying, you are the product. It’s also now clear that Facebook’s business models skirt very close to violating consumer privacy, if not outright violations. When working as designed, by the way, not through some breach or hack into the system. While Facebook has announced changes in the face of governmental scrutiny in the US and Europe following the Cambridge Analytica revelations, the response still seems pretty superficial. Lipservice, not customer service. As a result, while I wouldn’t sign a death certificate for the platform any time soon, consumer trust in Facebook has seriously eroded, and it isn’t doing such a terrific job at getting it back. At least so far. I’m not sure they can. So many of the problems are built into the very infrastructure. This leaves an opening for competitors. If you’d like to follow along, or think you might like to enter, details are at openbookchallenge.com. The competition is open to existing projects as well as new ideas/paradigms, but ideas alone are not enough. The main criteria for selecting the semifinalists and the eventual winners will be ability to execute. Reddit, Snapchat and perennial second place finisher Twitter are also in the hunt, but they may have too much baggage (and their own privacy violations) to prevail. Something will succeed Facebook. It’s not a matter of IF, only of WHEN. Right now, WHEN feels a whole lot closer than it has before. Mark Zuckerberg just spent two days in front of Congress, explaining, justifying, defending his company and its business practices. I continue to find it fascinating that the company that develops the tool that so many brands, individuals and even public entities rely on to build and nurture their communities, neglected to foster its own. Facebook has no friends. We use it, we run our ads on it, we publish our news on it. But we don’t like it. Which is why, now in its moment of need, Facebook is more or less twisting in the wind. Other publishers, other platforms have committed similar offenses. But in the court of public opinion, Facebook will pay for the crime. Contrast this to Apple which as a company is equally as arrogant. I say this typing on one of my 5 Apple devices so know that I have drink the Macintosh-flavored Koolaid deep. Apple however always — well before social media — understood the value of community and built its marketing strategy from the get-go around cultivating evangelists. We love the brand. So much so that we forgive an awful lot. Lousy overpriced computers in the late 90s. Batteries that drain far too fast. And we pay a premium to use the thing we love. It has always been true that if you are not paying, you’re the product. We now are starting to understand the true cost of using Facebook. This is the opportunity for a viable replacement to make its move, something that a year ago, I would have said was foolhardy. And no, I am not predicting the fall of Facebook. That is ridiculous. But it is vulnerable. Reddit, long mostly off limits to commercialization, has recently relaxed its stance about corporate conversation on the platform. Ditto Pinterest, which has extended the hand of friendship to publishers of late. Snapchat, still not dead even though Ms. Jenner claims to no longer use the service. There is a little more room at the inn right now for smart players that figure out how to reconcile the competing demands of commercial results and consumer privacy. We are finally, after 20 years, at a point where consumer data privacy in the US matters. To everyone, not just a handful of folks. We’ve also realized, I think, that even though regulation may stifle innovation, the cost of not protecting privacy through regulation is too steep. I personally wish we could rely on tech companies to police themselves and protect their consumers. Cambridge Analytica, and all the other extant examples for which the Facebook/Cambridge Analytica mess also serves as proxy, proves that we cannot. In Europe, privacy is considered a fundamental human right. Its data privacy law, the General Data Protection Regulations, codify consumers’ ownership of their personal data as well as the obligations companies that use or control consumer data have to that consumer. Our attitude toward privacy in the US is a little different. It is largely viewed in terms of individual rights vis a vis governmental authority. It is not a fundamental right, and our privacy laws such as they are, reflect that. Nevertheless online data regulation in the US now seems inevitable. Senators Markey and Blumenthal have already drafted a bill, and these are smart guys who have been around the online privacy debate for years. Markey in particular. They know the dangers of over-regulating technology. Yes, my friends, influencers do have influence. Here’s why we’ve gotten confused. Earlier this week, my friend Toby Bloomberg tagged me into a conversation on LinkedIn about evaluating influencers for branded content programs, spurred by a Medium post that argued influencers don’t really have influence. Influencers have influence. Ultimately, influencers are your customers. They buy (or don’t) your products and services, and they talk to each other. Some influence a few, some influence many. But there is always value in customer -centric marketing. The issue here is that we collectively have done a few things that contribute to the perception that influencers don’t have influence. I could write a book on this, and perhaps I should, in between trying to re-establish my consulting practice once again after 7 years inside. First, we talk about one group, influencers, which is misleading. There are really multiple subgroups, each of which has different characteristics, and should be folded into the marketing plan with different strategies and tactics. Microinfluencers are your customers who individually do not have tons of followers, but in aggregate can create a volume of earned media. Mid-tier content creators/bloggers are also your customers, but they have built a larger following on a blog or social platform, and can be tapped into as content producers for both the endorsement value and their distribution channels. Celebrity influencers are much more about their scale, and somewhat less about their role as your actual customer. Second, we need to activate these different types of influencers in ways that match their reach, influence and status as your customer. The same strategies don’t work across the board. We should start with our business objective, tap into the influencer population that will best help achieve that objective and the define a measurement strategy matched to the program. We also need to communicate those objectives and expectations clearly to the influencers we work with. It is OKAY to ask someone you are compensating to deliver a certain result. Our clients ask it of us. We should ask it of the people we work with. Not necessarily with crowdsourced strategies tapping into hundreds of microinfluencers, but certainly for content programs with mid-tier folks and celebrities. You cannot get mad at non-delivery if you don’t set an expectation. Third, we need to ground our content programs in relationships with our influencers. After all, they are our customers. There are no shortcuts to relationships. There is no tool, no database, no algorithm that can substitute for the relationship. Use automated tools to get started, to manage content production, to monitor and measure results, to understand the performance of your influencers. But don’t expect that you can define a target audience, search a database for influencers that match the target, or whose audience does, or both, hire them to do something without the due diligence of getting to know them, and then hope for the best. If you know the influencers, you’ll know whether and where they have influence. Finally, the original article was interesting in that it conflated two related but different marketing strategies, influencer marketing and thought leadership, in an attempt to make the case for thought leadership over influencer marketing. You can certainly tap into a customer (influencer) population as part of a thought leadership strategy, but by and large, thought leadership is about conveying ideas and building an expert reputation for the individuals and their organization, as a conduit to sales. Expertise does matter, and we may reach out to other experts in our field, with greater or lesser degrees of influence, to support and distribute our idea, but it is not the expertise of the customers. It is that of the brand and its representatives that is the focus. Each strategy, influencer marketing and thought leadership, has its place in the marketing mix, and we don’t have to pick between them. Agree with my ideas, but not sure how to get started? I can help with everything from strategy development and content creation to influencer, digital and social marketing, performance audits and presentation decks. Even better, the first hour is free. Email sgetgood@getgood.com to book your free consultation. I’ll give you some thought starters during our conversation, and we can go from there. The GDPR (Global Data Privacy Regulation) is a European law intended to restore control of personal data (what we usually refer to as PII, personally identifiable information) to the consumer. Under GDPR, businesses must comply with a set of strict stipulations regarding data collection and usage that require consumer authorization, both for collection and the intended uses. For more background on the law, AdWeek has a nice piece summarizing the regulation from the perspective of advertisers, agencies and tech companies. and the EU has an excellent interactive infographic. GDPR changes the worldwide advertising playing field. Even though it is a European law, compliance will be expected from any company, anywhere, that might have access to an EU citizen’s private data. On the technical side, which I am not going to cover here, the data management platforms and ad tech companies that support advertisers, publishers and the programmatic media infrastructure will have to manage permissions to ensure that no one is using data in an unauthorized manner. All data – first, second and third party. It’s a huge effort. Complying with the provisions of GDPR is table stakes. You have to do it or risk pretty hefty fines. Brands and publishers will need to be transparent about data collection and use. In order to obtain, and retain, permission to use customer data to target, retarget, market, they will need to demonstrate value for their use of this information. As perceived by the customer. This is the opportunity and the silver lining to GDPR. It is now far more likely that brands and publishers will invest in innovative permission-based marketing to differentiate themselves from the pack. … for publishers, re-selling each viewer at a slight mark-up for what it cost to acquire that page or video view is not sustainable. Unless you add measurable value to that view, such as increased conversions, the pyramid will eventually collapse. Brands will figure out that they can buy those views, that awareness, cheaper if they go direct. We now can go beyond the table stakes of privacy regulation, and build the permission-based proprietary audiences that will deliver true advertiser and consumer value. What are we delivering to the reader/viewer/listener in exchange for the permission to use the data that we seek? Is it truly differentiated from the competition? If not, think some more. You must offer unique value to make it worth giving YOU the permission to store and use personal data. This is just as true with a subscription offering. Subscriber data is still used to market the audience to advertisers, and just as subject to GDPR. The paywall only increases the demand on content value. Make your voice matter. If your publication/channel is the go-to source for the audience, your editorial voice becomes relevant again. 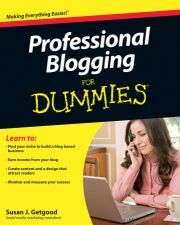 Even though the brand can buy your audience elsewhere, it cannot buy your editorial endorsement anywhere but from you. Community – Building a community around your content through exclusives, discounts on services, events (on and off line). Digiday is an example of a publisher creating a community of senior marketing execs around a paywall offering. Infuse your content with your customer — whether sponsored content created by influencers, or crowdsourced reviews or live stream events in which they can participate. New content streams. Go beyond digital and video, and look at podcasts and events as ways to lock in your unique value, your unique audience. Vox Media and Crooked Media are two examples of firms successfully exploring new content streams. Newsletters are the ultimate permission-based marketing tool, so don’t use yours just as a billboard for content that is consumable on your site. Add additional value, shoppable links and images, even original content that is only available in your newsletter. Your objective is to create an ecosystem of value in which your user (or prospect if you are a brand) regularly extends and renews permission to use her/his private data. You still have to abide by the GDPR rules, and be transparent about how you use data, whether you share it with others, and so on, but provided you don’t betray the trust of your reader/viewer/listener by breaking those promises, at the end you will have something far more valuable than retargeting data. You’ll have a loyal audience. And that can’t bought. It can only be earned. 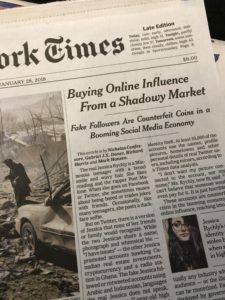 This week in influencer marketing: New York Times “discovers” Influencer fraud; Washington Post columnist laments changes in online mom influencers; Facebook changes the rules. Again. In my post on January 22d, I noted that there was at least one article about influencer marketing every day, often more. This week was no different, except for a change, the articles weren’t only in industry press. They also were in the papers that many consider the newspapers of record of the United States, The New York Times and The Washington Post. This is not news. 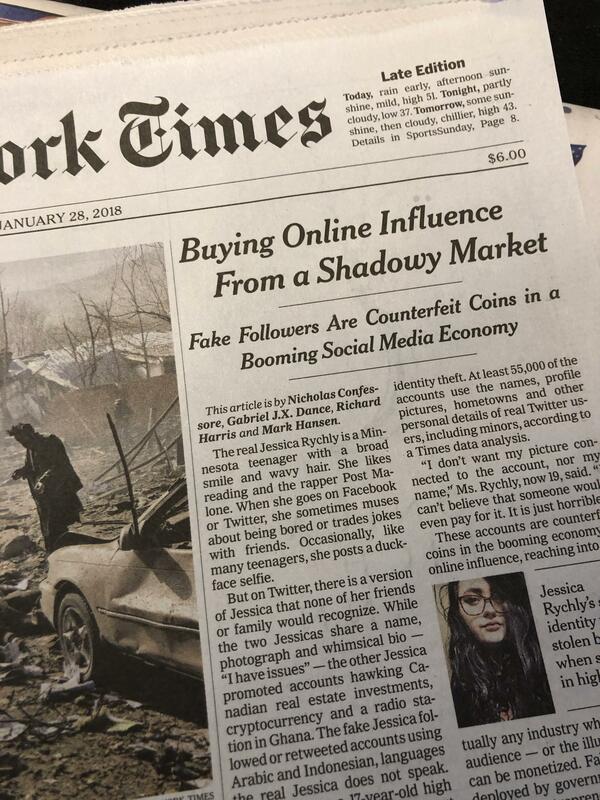 We’ve long known that the social platforms are chock full of fake accounts. ALL OF THEM. But most especially Twitter, the subject of the NYT story last weekend and follow-up posted on Thursday. What is news is that it made it to the front page of a paper of record. The NYT article dug into the business practices of Devumi, a firm used by celebrities, politicians, athletes and other prominent Twitter users to boost their followers. Long story short: lots of fake followers, often based on the identities of real people, artificial scale at best, fraud at worst. The follow-up article reported that in the days after the original piece, many fraudulent accounts just vanished. Oh, and the company moved OUT of Florida, where it was about to be the focus of an investigation, reportedly to Colorado. Lots to unpack in this, from the responsibility of the social platforms to better secure their systems to the imperative of scale to prove influence. The latter is what interests me for the purposes of today’s post, although I expect I will comment on the responsibility issue at some future point. Certainly, there are celebrity influencers with huge Twitter followings on the roster of the companies that sell fake followers. It stands to reason that in the search for scale, some took a shortcut. Not news. Influencer marketing agencies and platforms know this, and have taken what steps they can to guard against it, as reported in Digiday. From my perspective, this news is one large exclamation point to the value of quality over quantity when it comes to influencer marketing. Don’t get trapped into a numbers game that is easily gamed. Focus on building real relationships with the influencers who are your customers, your fans, your advocates. Less is more. Advertising is and always will be about scale. It’s job is to cost effectively reach the largest number of interested people with your message in the shortest amount of time. But influencer marketing is a different animal. Solid influencer marketing builds on relationships with influential customers who choose to advocate for your brand to reach other customers in authentic ways. Too much focus on scale perverts the fundamental nature of social influence. Not that scale isn’t important. But not at the cost of everything else that makes social influence effective. Perhaps now the demand for scale will be tempered a little bit with an understanding that scale does not necessarily equal quality. My hope is that more folks will be receptive to this approach and stop chasing BIG follower numbers, choosing instead to match their influencer approach to their marketing objectives. When scale makes sense, such as launching a new product, and you need to raise awareness, turn to microinfluencers or celebrities to spread the word fast to many. But your bread and butter influencer strategy should be grounded in your true advocates, of any size, whose passion for your brand has real influence, and convinces others to try, buy, believe. I am the eternal optimist. I feel like I have read this piece before. That’s not true, of course, but I have read so many like it in the past 15 years. From the fears of the longtime netizens when the web first began to commercialize to the circa 2008/2009 lamentations about the commercialization of blogs (which BTW led to the creation of Blog With Integrity,) and regularly since then, the constant refrain is that somehow sponsored content must be less authentic than spontaneous endorsement because it is solicited and curated. In this article, the author misses the good old days of mom blogs, which she recalls as the authentic stories of parenting challenges, and bemoans the careful polish of today’s sponsored Instagram posts. Fair enough, and everyone is entitled to an opinion, But here’s the thing: the good old days always look better than today in the rosy glow of history. Some day, today will be the good old days. The reality? There was good sponsored content and bad sponsored content “back then” and mom bloggers didn’t necessarily share everything even if it appeared more raw. The social currency was then and will always be the trust of your audience and the care which the endorser takes to ground her endorsement in a context that resonates for her readers. There is no single perfect social platform, only the one where your customers are. “Back then,” blogs were the logical successor to forums and chat rooms, where many of the early parenting communities took root. Today, 15 years later, the new parent is likely from a completely different generational cohort. One that largely grew up digital, mobile phone in hand. Bottom line, if you are trying to reach millennial parents, visual formats like Instagram, Snapchat and video are a good bet for your marketing message. That doesn’t mean that long-form is dead, or that no one is writing blogs anymore, or that Instagram has simply become a product billboard. Your social experience is what you make it. There is plenty of good writing, video and podcasting out there, if you want to find it. It may be advertiser supported, or part of a more traditional media property, or even behind a paywall, but it’s there, in parenting and any other vertical you care to name. There will ALWAYS be people who want to tell stories. The question you have to ask yourself as a reader, is how do you want to support those storytellers? If you are getting the content for free, whether through Instagram, a podcast or a blog, you need to accept a certain amount of advertising with your content. You can decide how MUCH you want, but it isn’t fair to deny the storyteller fair compensation. For their part, marketers need to be honest with themselves. Very little endorsement is truly spontaneous. Very few brands can generate unsolicited endorsement at scale. You need to pay to play somewhere. Isn’t it great that we can direct some of those dollars right back to our customers? I think so. eMarketer reports that Instagram is the most popular influencer platform, per research by influencer platform Zine. Of course it is popular. It is easy to do, for the brands and the influencers, perfect for fashion, beauty and food, fast (no waiting 6 months to see uptake like with Pinterest) and the metrics are still squishy enough that “engagement” still counts as success. There are more Instagram influencer agencies, networks and platforms than I can even count any more, and new ones every day. All vying of course to be acquired by a bigger fish. Maybe even the biggest fish, Instagram/Facebook itself. But it isn’t the only way to engage your influential customers as online advocates and evangelists. Blogs, Facebook, YouTube, bespoke online communities, your own website, media sites, even Reddit, Twitter and Pinterest, all have something to offer to the influencer marketing mix, depending on your objectives, your product, your timeframe, your customers themselves. So use caution when faced with data showing Instagram as the winner in the sponsored content stakes or as doubling in size from 2016 to 2017, as one recent study from Klear touted. Of course the use of Instagram for sponsored posts grew significantly year on year, but Klear measured based on the presence of a disclosure hashtag, either #ad or #sponsored. This leads to a faulty analysis. You can’t compare the market in the (relative) wild west of 2016 , when many were largely still ignoring FTC rules, to 2017, when the FTC regularly issued warnings to influencers about poor disclosure and people started cleaning up their game. Increase, yes. Double? Doubtful. There are probably a whole lotta posts in 2016 going uncounted. But, yay for better disclosure practices in 2017. Better disclosure is a good thing for consumers and for the social marketing industry, and about time. Facebook changes the rules. Again. Facebook has narrowed the acceptable uses of its branded content tool. In a nutshell, the person or entity POSTING the item must be the creator of or significantly featured in the content being promoted. You can post a sponsored video you created or star in but you can’t post a video for the sponsor in which you did not participate. Effectively making ads the default solution for most current video distribution. In my opinion, this will translate into a short term decrease in opportunity for influencers who use their Facebook page for sponsored content, but a long term gain, as brands return to using more influencer generated/featured content in their marketing programs. Wanna hear me talk about all this? One of my key recommendations for digital success in 2018 was to diversify your content distribution strategy and focus on building a loyal audience that regularly returns for your content. I am batting 1000, so figured I’d drop one more on you. The influencer marketing industry will see significant consolidation by the end of 2018. It’s already started, with the acquisition of Whosay by Viacom earlier this month. Every day, I read at least one, and sometimes two or three, articles announcing that 2018 will be the year of influencer marketing. Influencer marketing as a marketing practice has been around for a decade or so, since the very first blogger relations programs circa 2007/2008. Customer centric marketing, as a buzzword if not in practice, has been around even longer. The idea of using your customer as an evangelist, as an advocate, is not news. What IS news is that it is now an important element in the marketing plan for many brands. A must-do, not just a nice-to-have. This trend has been developing over the past couple years. You can almost follow its growth by tracking the growth of influencer marketing agencies, platforms and networks. Ten years ago, it was a handful of companies. Now, there are countless specialized agencies and technology platforms, nearly every consumer publisher has some influencer offering and the integrated agencies, not to be left out, have both practices and products to offer their clients. As Digiday reported this morning, brands are also increasingly bringing all or part of their influencer marketing in-house, using a combination of internal staff, agencies and technology platforms/tools. While there is plenty of work to go around, I predict significant consolidation. Here’s why. You shouldn’t build your business on someone else’s platform. As influencer marketing increases its importance in the marketing plan, it will be critical to protect the investment. That is certainly why Viacom bought Whosay rather than continue to work with it as a vendor. Bonus — acquiring the platform you use removes it as an option for your competitors, another common reason for mergers. As a result, the most promising small companies will be acquired, by media companies, agencies and larger more established competitors that can extend the platform (and the acquisition costs) across multiple advertisers. Some of the big consumer brands are possibly also in the mix as acquirers, but I think that less likely overall. All these companies could develop their own solutions from scratch, but honestly, there are so many start-ups in the space, it is a far smarter business decision to buy, not build. Not every brand that wants to use influencer marketing as part of its strategy will have the means or interest to acquire a platform in-house. There will still be need for independent software companies and agencies that sell various combinations of platform, services and influencer access. But consolidation will reduce the industry back down to a reasonable number of tech companies, some of which will focus on small and mid-sized business, and others that will operate on the scale, enterprise level. Much like any other SaaS product. It is an inevitable right-sizing. Some firms (see above) will be acquired, some will acquire smaller competitors, and some will close their doors. The key for brands that choose to use outside platforms will be to protect their data. To retain control over their results and the influencer relationships they nurture. This means making sure that they can capture and keep the data about the influencers they work with, and the results of the campaigns they do. Otherwise, they risk becoming hostage to a technology platform. You want to make absolutely sure that your information is stored to be portable to another platform, and that you are contractually permitted to do so. You need that fail-safe, because, I repeat, you shouldn’t build your business on someone else’s platform. Who will be the winners? It’s anybody’s guess about the tech platforms (although I have a few,) but no matter what, the customer is a winner. Those that have nurtured their social influence, whether big or small, are getting a piece of the advertising pie. And for all of us, sponsored influencer content is better, more authentic, more engaging advertising. Facebook changes algorithm, but nothing really changes for brands. It’s a pay for play world. Facebook announced last week that it was changing the algorithm to favor posts from friends and family over those from brands. It also recently gave users access to the SEE FIRST button for personal profiles as well as brand pages, allowing users to note whose updates they wanted to see first. This is great news for Facebook users, who have been complaining that the algorithm seemed to deliver posts from the same handful of friends, ignoring many others. “I never see your updates,” the oft-heard refrain. Cue, immediate uproar from publishers, advertisers and brands that these changes would prevent their fans and followers from seeing THEIR updates. Tempest in a teapot. The only way for brands to reliably get their content in front of their audience on Facebook at scale is to advertise. Facebook ads, boosted posts, branded content. Now it is simply more obvious. In the short term, yes, these changes are unfortunate for those brands that have developed models for organic Facebook success. They will have to rethink their models and consider using paid posts to get the sharing started, rather than just relying on their content to drive organic shares. But, as long as the content is good, and worth sharing, does it really matter that you have to invest in a small amount of paid to get the party started? I don’t think so. I have long believed that what matters isn’t whether something is paid, owned or earned. It’s whether someone wants to share it. Previous posts on this topic include Shining a light on the native advertising debate from 2014 and Is earned media an anachronism from 2011. Net, not much has really changed for brands. Facebook is just loudly fixing something that has hampered its user experience, and basking in the brownie points from billions of users. By this week, the digital advertising press seemed to agree. Nothing new here, more of the same said both Digiday and Adweek. The past 6 months have seen tremendous upheaval in digital media. Companies that were once high flyers — Mashable, Rolling Stone, Time — sold for a fraction of their former (perceived) value. Whether you think this is massive disruption or simply inevitable course correction, the ingredients for digital success have evolved. It’s not enough to have a mobile-first site with strong traffic, SEO friendly content, a way to deliver video pre-roll and a good native offering. You DO have to have that, but digital success in 2018 requires a few more ingredients. Scale alone is not enough. Here’s my recipe for digital success in 2018. Whether you are a digital publisher or a brand extending its content strategy, below is my take on how to turn readers and viewers into true audience that you can then further monetize — events, products, e-commerce etc. Content with a point of view will be more successful than content that tries to be all things to all people. Vanilla is a lovely flavor, but if everyone offers that same vanilla, content becomes a commodity. Point of view isn’t necessarily an opinion or a “stand;” you don’t have to be news or hard-hitting to have one. It can be everything from a niche target, an overt POV, to a more subtle theme or vision underlying and holding together the content you create. It is NOT a mission statement or manifesto, although those can part of a point of view. 2. A deep understanding of and commitment to your customers — both the one you have and the one you want. Point of view is likely something you share with your target audience or customers. The more you know about them the easier (but never easy) it will be to build a product they will love. This is equally true if your project is 100% digital, or digital is simply the gateway to purchasing a tangible good. You also have to be committed to looking at your business with a customer-centric lens. Everything truly does depend on making the customer happy. Shortcuts may get you through in the short-term but long-term success for any brand is about delivering to customer needs. Consider expanding the C- suite to include a Chief Customer Officer to be the steward of this effort in partnership with client service, marketing, sales, finance and operations. Data drives decisions. What gets measured, gets managed. You’ve probably heard these phrases more than once in your career. Simply put, the things we measure are the things we can effectively act upon. If you don’t have data, you can’t adjust, optimize, improve. Of course, for measurement to be effective, you have to define a baseline for success up front so you measure the right things, not every thing. All data is not equally important. Analytics (website, social platforms, campaign performance) are just the first part of a comprehensive research plan. Third party research data is the second. And proprietary research – into your audience, your content performance, market opinion — is the connective tissue that brings analytics and third party data together into meaningful, actionable information that you can use to make your content better and differentiate from the competition. Our first set of ingredients are the traffic drivers. How do you find the audience and bring them to your content? SEO is your first, and best, friend for building traffic. Nothing — not even paid search — replaces strong organic search results. You can build an internal SEO team or contract an SEO firm to develop your SEO plan and process. However you choose to operationalize SEO, it should be a continuous loop between the content creation team and the SEO management team. But search alone is not enough to ensure success, and you shouldn’t expect it to deliver all your traffic. Against one measure, it scales amazingly well. One well written, search-optimized article can deliver many readers against multiple queries. On another, not so much. You acquire every reader one search at a time. To achieve any scale, you have to keep feeding the beast fresh new content all the time. Even though you can update older content, you still need staff to write and edit. Search is the foundation of your traffic strategy, but it isn’t the whole structure. Social traffic isn’t the panacea either, but you need a robust social strategy to distribute your content on the popular social platforms. Specifically Facebook, Instagram, Pinterest and Twitter (in descending order of importance). Earned, or “organic,” mentions of your brand are important and you should by all means start with a social communications strategy that leverages your owned social accounts to spread the word about your content and initiatives. But don’t expect earned social to get the volume you need. For most brands, organic social reach is a delightful myth. While your audience may follow your accounts for the news, they aren’t going to re-share it at the volume you need to reach new audiences. And then there’s the fact that the algorithms of social (Facebook in particular) are DESIGNED to push you toward paid social. Ads, boosted posts etc. Don’t fight it. Embrace it. Make it work. My advice is to post your news and stories and get the organic reach that your audience will naturally deliver. Then boost the best performing posts to reach new readers. This will increase the potential pool that might share the content, thus increasing your earned media. Branded content in the form of influencer-generated posts is an important ingredient; consider MarketingLand’s report this week on research done by social analytics firm Shareablee showing that viral reach from branded content ads on Facebook eclipses standard ads. The power of native content is why you should use your web and social analytics, and even your SEO analyses, to identify the best content to put in native advertising units. Publishers may prefer to promote the branded content they create in their native units, but increasingly they are opening their inventory up to native programmatic as well as premium native advertising using content sourced elsewhere. Plus of course services like Taboola and Outbrain, although I recommend that you regularly evaluate whether the traffic you get from less-premium sources is the same quality that you get from more premium sources of traffic. But like SEO, social posts and native ads deliver one reader, one viewer, one click at a time. Scale requires volume. Every increase has a real cost to produce and distribute the content. It’s effective, but not terribly efficient. In addition to growing your unique users, you need to convert those one-time readers and viewers into a loyal audience. You want them to keep coming back for more, and consuming more than one piece of content at each visit. In analytics terms, you want your uniques to keep growing, but your page and video views to eclipse uniques. In my opinion, 4x is a baseline for good, and you really want it to be much more than that. Our next set of critical ingredients are the engagement and loyalty drivers. These ingredients deepen your readers’/viewers’ relationship with your content. What’s old is new again! Newsletters are the best mechanism to get casual readers/visitors into into your content ecosystem and regularly coming back for new content. Because they are permission-based, with the user having control over what data is shared with the publisher, they are more compatible with privacy regulations like the European General Data Protection Regulation (GDPR), which will become increasingly important for any firm doing business with EU nationals when GDPR takes effect in May 2018. That said, getting permission from the user is only part of the privacy mandate; you also have to protect it, so your newsletter tech needs to be super smart. Bottom line though, the more you can get the reader/viewer to share with you (first party data), the less you will be restricted by potential regulations/restrictions on the use of third party data from the big databases. That means delivering real value in exchange for personal information, and the more you ask, the more value you must add. Don’t use your newsletter simply as an index to articles on your site. Folks may subscribe but they won’t necessarily become loyal readers (and repeat visitors) if the newsletter is nothing more than a promotional tool for your articles. Take the time to create some original content around the articles you recommend. Follow the example of Digiday; its daily newsletter highlights articles from the Digiday site, but it places them in context, giving the reader value even before she clicks over. Website design matters. It is all well and good to say that no one comes to your home page, so giving it undue importance is wasted effort. For many, site visits are driven by search and social directly to the content. But the structure of content on the site once someone gets there and their ability to discover new, relevant content matters. A lot. Publishers and brands need to invest in recommendation engines and native units that bring readers/viewers deeper into content based on their interests. Baseline is a smart keyword/topic match to the article/video they are reading or viewing, but we need to push the envelope on this. As we build stable databases of loyal readers’ preferences and past viewing habits, we should make inferences about the type of additional content they would like to consume, both editorial but also branded content. The better we match our recommendations to their interests, the more likely they are to consume multiple pages of content by choice, and not just because you split the content up into 7 pages. Digital publishers by and large have struggled with video. There is huge advertiser demand, nowhere near enough quality inventory, and strategy after strategy to manufacture it has met with lukewarm success at best. Facebook seems to be the hands-down winner for delivering targeted video eyeballs, followed by the video aggregators like Jun Group who have fed the digital demand of both publishers and brand-direct. What seems clear to me, whether you are looking at digital, linear or OTT, is that successful video strategy is grounded in more than just delivering consumer eyeballs through targeting and audience acquisition strategies. If you BUY every view for slightly less than you re-sell it to your advertiser client, your business cannot scale efficiently. It works for a while, but eventually the advertiser figures out that she can buy that same eyeball direct. To be successful with video, it comes back to figuring out what resonates with your audience, what fits with your editorial or brand mission, and most importantly, what you can do better, smarter than the other guy. I wrote about this in September. Success is rooted in smart content strategy, incorporating video where it makes sense for the story, not simply to deliver advertising. We shouldn’t pivot to video; we should integrate video into a multi-format digital strategy that includes all sorts of content. For a successful publisher’s take on this issue, check out Digiday’s report on Bustle’s strategy. This generation looks at and engages with content — both digital and IRL — differently than the older generations. For many in the cohort, video is the preferred communication medium. Business sites that want to reach this new worker need to think about how to incorporate video into their content strategy. For what its worth, I think it helps to think about video as 5 basic types. News / Documentary — current events, educational, fact-based. Your purpose is to convey specific information to viewers, and you may or may not have a specific point of view and desire to convince / persuade. Comedy — Make ‘em laugh. Caught on Tape — There is a reason “America’s Funniest Home Videos” has been on television for more than 20 years. People LOVE to watch real people and animals in funny, silly situations. The quality of the videos may be dodgy, but the quality of the engagement is not. See also babies, puppies and kittens. How-To – do just about anything. Cook, apply make-up, style a wardrobe, decorate, garden, change a tire, take pictures, make videos, even business topics can come to life in video. You name it, there is a how-to video to show you the way. This is the easiest type of content for publishers and brands to add to their sites, and our appetite for it is insatiable. Scripted entertainment with HIGH production values — the market has been cornered by linear and OTT properties created by the big entertainment studios, especially at long-form, but I think there is room for scripted short-form where talented amateurs can be competitive with the big guys. In my opinion, there are two successful video strategies. You can specialize in one type of video, and go deep and long to meet the needs of your audience for that type of content on your channel. In an increasingly crowded marketplace, you must have an unserved or underserved niche to be successful. The other strategy, which is the one most publishers and brands would be well-served by, is that you integrate the appropriate type into your story telling as needed, but your focus is the stories. You don’t need to specialize in one form as much as you need to make sure that the video you are creating is additive to the stories your audience comes to you for. Note that some of these formats lend themselves naturally to the development of community, ie the fans that are loyal viewers. For example, comedy shows, reality TV, and character driven drama or comedy. Others are more likely to be driven by search engine results such as tutorials. Current events are a bit of a blend. We may be fans of a particular franchise such as The Rachel Maddow Show, but much of the time, we are driven by search about a specific news item. Make small, smart investments in your original video programming, and then look at the numbers – what drives traffic and engagement? Do more of that. Drop anything that doesn’t work, no matter how much you love it. Influencers must become part of your content ecosystem. For branded content but also more broadly to extend the footprint of a publication or brand authentically into the community. This takes a different shape if you are a brand using your content strategy to directly promote your company and its products or a publisher, aggregating content and monetizing through advertising, but the fundamental principle is the same. Go beyond seeing your customers as content or product consumers, and engage your audience in the content creation process. Last fall, I outlined how this might look for a digital publisher. The most important thing to remember is that you want to create multiple touch points for your customers into your brand or publication, and leverage their contributions as much as you can. Everything from deep relationships and extended partnerships with brand ambassadors or top-tier contributors to simple content creation programs with mid-tier influencers and earned media with micro influencers. Many publishers are leaving money on the table by not integrating shopping into their sites. For branded content for sure, but also to earn against the products used in the normal course of business. Where can I get the clear mixer bowl in that video? I love what the host was wearing. Show me similar outfits. One needs no further proof that this is a smart strategy than that Amazon has launched an influencer program to develop branded content as an extension of its affiliate marketing program. CRO and President of Diply Dan Lagani sat down with Cheddar to talk about the potential of e-commerce for digital publishers. But for long-term success, publishers need to develop e-commerce strategies that do not depend on Amazon affiliate income; Amazon will likely start cutting its affiliate commission rates as it further develops its own content strategy. Whether they choose to go direct to brand, partner with the affiliate networks like CJ Affiliate and Rakuten or partner with retailers, the key will be to integrate the shopping cart in such a way that it is non-intrusive to, but integrated with the content experience. The smarter, the better. Bonus for integrating influencers into the mix, as ShopStyle does. The other e-commerce play is to have your own product line. Not every publisher has the wherewithal, the brand or the stomach for this, but if you have your own products, you are the original channel  Subscription boxes were all the rage this year; no matter what your interests, you can probably sign up for a box of merchandise to be delivered to your door every month. 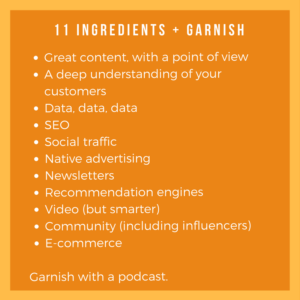 A podcast, my last ingredient for you, is more of a garnish than a requirement, so I am not counting it among the 11required ingredients for 2018, but I suspect it will be one by 2019. Podcasting is the most social of social media. The format is so simple — a conversation between/among two or more people that makes us feel, with the intimacy of sound, like we are seated at the table too. According to Edison Research, podcast reach has grown by 50% over the last four years, and nearly a quarter of Americans age 12 or older listen to a podcast monthly. Podcasts are most popular among 18-34s, but teens and the 35-54s are also listeners. 41% of Americans listen to some form of “speech” audio on any given day. Right now, the playing field, and opportunity, is wide open to all. The duopoly of Facebook and Google are no better situated than any other player to establish a podcast audience and generate revenue from (and with) that audience. Even though many big advertisers are still waiting for listener metrics to get better, Edison projected podcasts to earn $220 million in ad revenues in 2017. Publishers searching for new sources of revenue would be well served by considering a podcast. It ticks a lot of boxes — content, community, native advertising, low barrier to entry and easy to experiment with formats. The fast and simple way in is to sponsor an existing podcast that aligns with your brand values/proposition and reaches your target audience. The longer way around, and the more lucrative for a publisher, is to create a new podcast that delivers unique value for your brand and to your advertisers. I highly recommend looking to your community of readers/viewers/influencers for both hosts and guests. 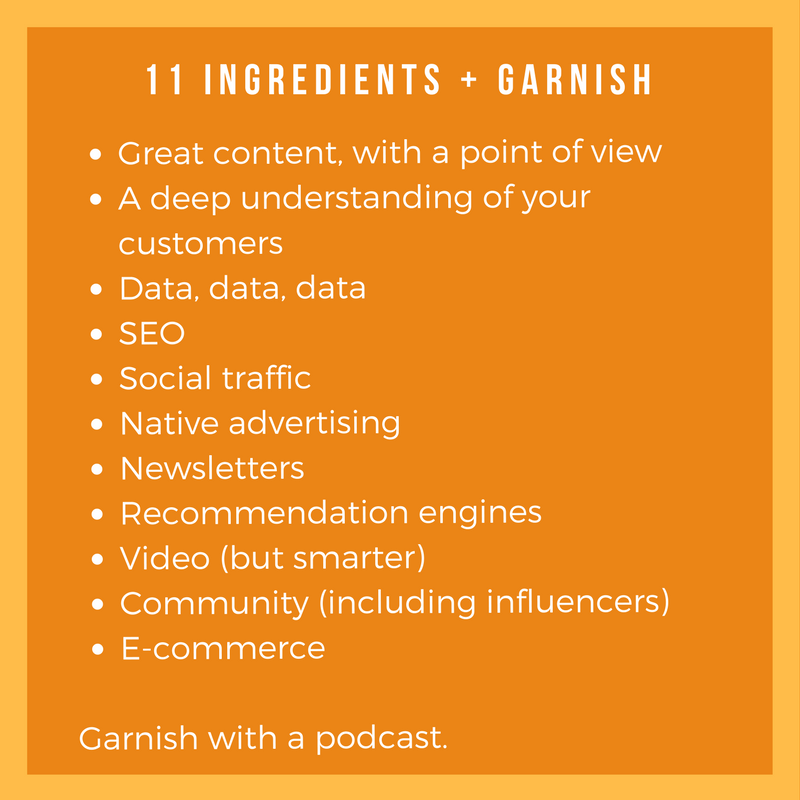 And there you have it — 11 ingredients for digital success plus a bonus garnish. Thanks for sticking with me to the end.